My original plan was to wait until October to post these (don't want you to get spoiled! ), but I didn't have anything else ready for the blog. So here they are! Consider them an early treat for Halloween. These were taken after the Airmen of Note concert on September 17, 2016. 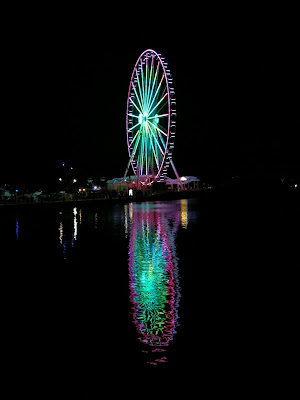 It's the Ferris wheel at National Harbor, brightly lighted in dazzling colors. They change as the wheel turns, so the two pictures have slightly different hues. 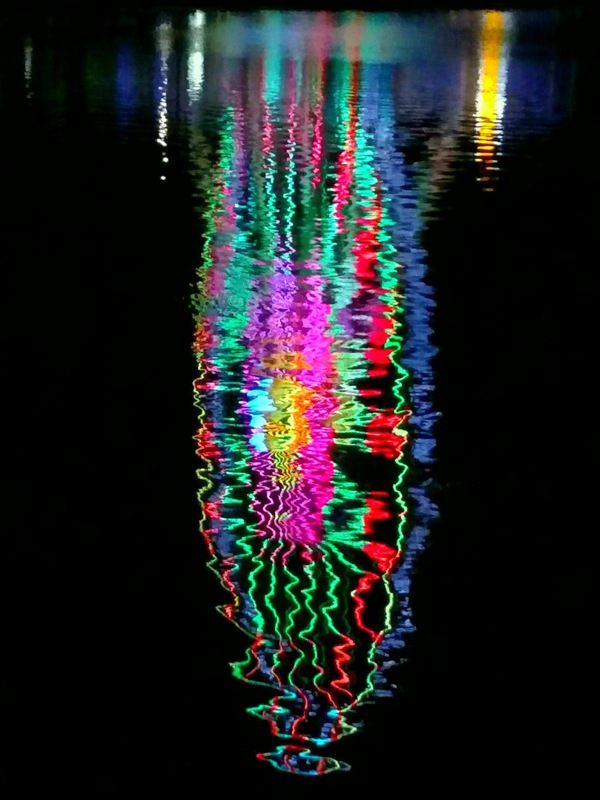 The second picture is just the reflection in the water. Well, that's all for now. Maybe in a month or three I'll post some new pictures! Images IMG_20160918_NH-FW1.jpg and IMG_20160918_NH-FW2.jpg ©2016 K. R. Smith - www.theworldofkrsmith.com - may be used, in whole or in part, with attribution. ...and yes, it seems like ancient history by now. 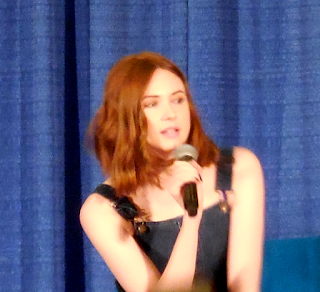 After getting my picture taken with Barbara Bouchet and Michael Forest, my group went downstairs for the talks given by Karen Gillan and John Noble. Although I had seen Karen in Doctor Who (as Amy Pond) and in Guardians of the Galaxy (Nebula), I really didn't know much about her. She has done a lot of work, and much of it is sci-fi. Unfortunately, I had trouble getting a good picture of her. There were lots of questions about Doctor Who, of course, and the usual ones about her favorite roles and similar things. Shore Leave 38, Hunt Valley, MD. Karen Gillan about to receive her "Bunny" award. 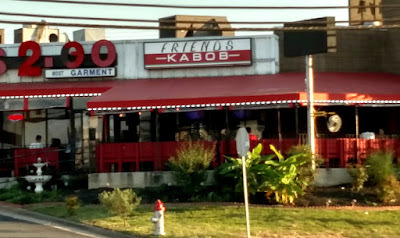 After that, it was time to grab a bite to eat. Once we finished, we waited in the foyer area where many of the actors and actresses were signing autographs. Below are Zoie Palmer and Anthony Lemke. at Shore Leave 38, Hunt Valley, MD. John Noble was the next speaker to take the stage. I knew him mainly for the few episodes of Fringe I had viewed, but like most actors and actresses, I'm seldom familiar with their full range of work. Many of the questions for John were about Fringe and Stargate, though he did relate a good number of personal stories. 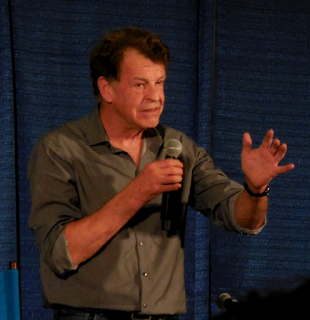 He was one of the more entertaining speakers at Shore Leave 38. 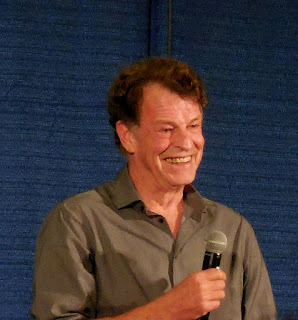 John Noble answering fans' questions. John Noble getting a laugh from one of his fans. 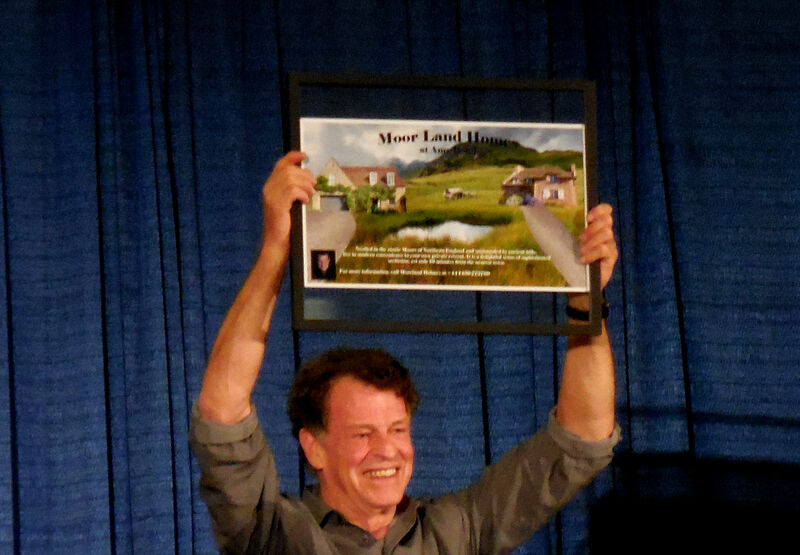 At the end of John's talk, they auctioned off a property deed for charity. The "deed" was for Moor Land Homes at Amy Pond. A fitting location since Karen Gillan was in attendance! That's all for now. 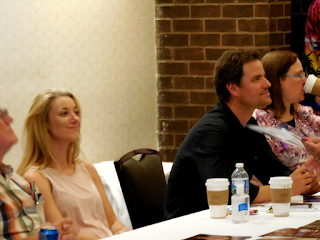 I'll wrap up the happenings at Shore Leave 38 in a future post! 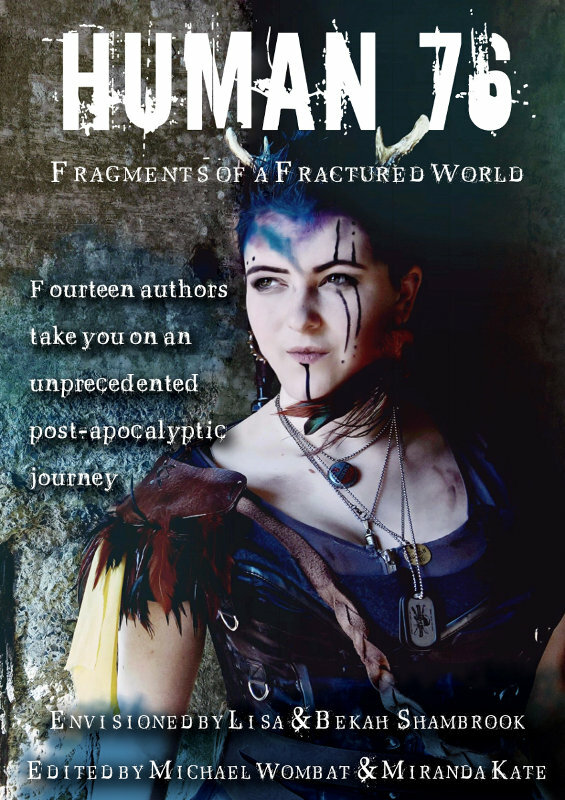 In the meantime, you can read my story, The Song of Aiden, in Human 76 - a post-apocalyptic, shared-world anthology! Check #Human76 on Twitter for news! Temptation, Get Thee Behind Me! One of my biggest problems as a writer is that I am easily distracted. It could be anything: colorful baubles, the latest motorcycle, videos on Emergency Kittens, or worst of all, a new request for submission. I'm always looking for the next place to send a story when I have over 20 in the works I need to finish. I see the posting and say, "Oh, I have an idea for that!" Within seconds of those words being spoken my current work-in-progress gets shoved to the back burner. in the town of Red Leaf Hollow! It’s fall in the small New England town known as Red Leaf Hollow. It’s not on any map but it’s been around as long as the sun and the moon. The first snow is coming, but for now, the town is getting ready for All Hallow’s Eve and preparing for the harvest festival – a huge celebration before winter’s grip. Red Leaf Hollow is known for its strange happenings, its odd occupants, and the things that slither and haunt and howl in the night. The sleepy town of Red Leaf Hollow is divided into two sides by the large and bustling (and sometimes blood red) Crescent Moon Creek. Crescent Moon Creek, named after the river that separates it from the other half, is the only place where one may view the moon clearly through the thick trees and forest. It holds the town Commons where the harvest festival occurs, large Victorian houses, and tiny witch shacks that line the cobblestone streets. Shadow Crest is on the other side of the river, where trees and plants always die, along with its residents. It is also home to the Hollow’s cemetery, Morningside, where inhabitants know better than to linger, especially after dusk. Shadow Crest is also home to Harvest Hill, a dead lump of land that once held the lumber to build the Founders’ homes…and coffins. Red Leaf Hollow is home to the annual Werewolves convention, where people who have died return from the grave, and where many of the Salem witches fled to escape persecution. 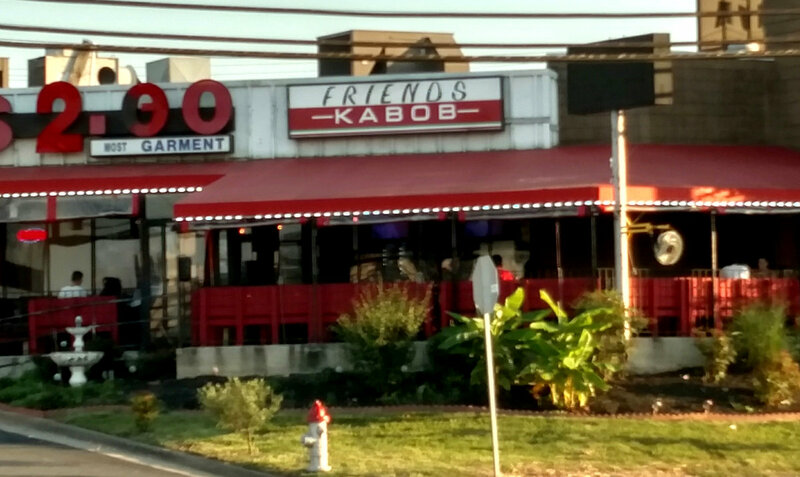 This is where witches drive black cats in the sidecar of their motorcycles and zombies are usually holding another 5K Moanfest. You’re the odd one out if you DON’T have a ghost in your house. Pumpkins line the streets and the houses and even some of the inhabitants’ heads. Bring us your creepy, ghostly, and ghoul-y from the past or present. Bring us the things only you can see. Show us things that hide just below the surface of reality or under the stairs. Bring us colorful leaves swirling at your feet and brisk autumn days and nights under bright glowing stars and dark looming trees. We want creepy graveyards, legends, secret gardens, severed heads, monsters, dancing skeletons, burial grounds, secrets, witches, magic, curses, hauntings, macabre romances, and unexplainable events. But you get the idea. I'm supposed to be continuing with my Shore Leave 38 blog posts. Instead, I'm writing about how easily I get distracted. See how that works? 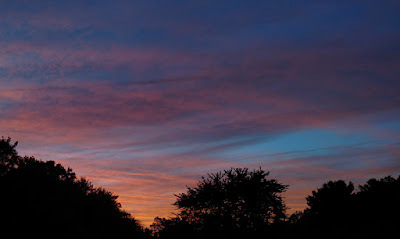 This Month's Free Photos - Sunsets And Food - Maybe? Yes, I know I'm supposed to get back to the Shore Leave posts, but I keep getting side-tracked. There was a great sunset this evening, so I took a couple of shots to post here. 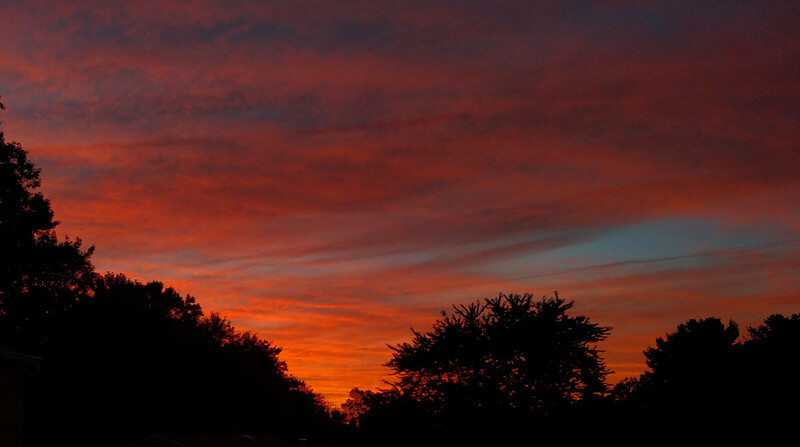 The sky got progressively more orange as the sun set. Forget about the U. S. presidential elections, here's something of real importance! Human 76 has been nominated for an award by the Indie Book Awards. Maybe not the biggest award, but an award nonetheless. And you can help it win! How? By voting for it! Just to let you know, I'm not proud. I'll be happy if you vote even if you don't know a thing about the book. So, vote early and often. Yes, this is exactly like the presidential elections! Anyway, it's nominated in 2 areas, Anthology and Dystopian. You can vote once per day (in each category) until the voting is done (10 days). 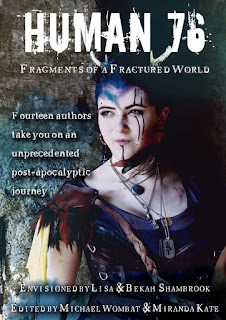 In the event you have no idea what Human 76 is, it's a shared-world, post-apocalyptic, sci-fi anthology (hence the anthology category) about a young woman's search for her younger sister in a land recovering from a nuclear holocaust. You can find links to it on my "My Works" page.